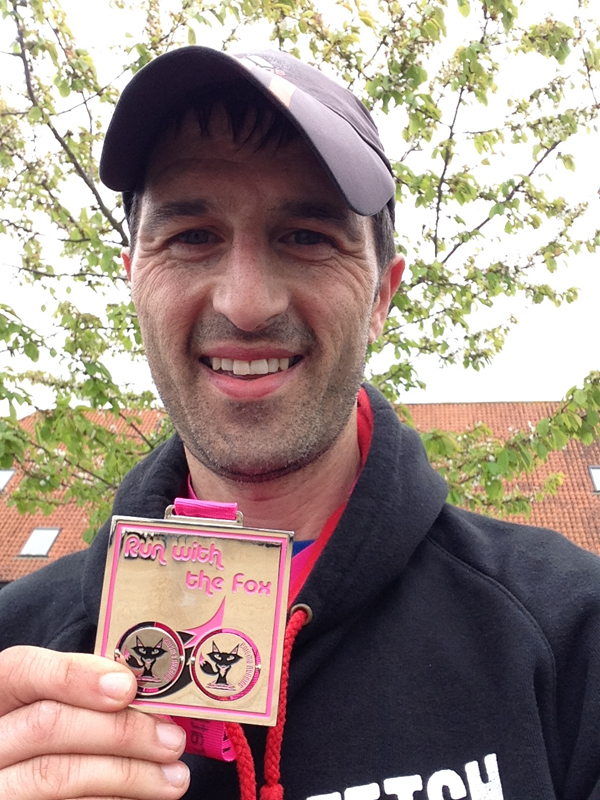 5 days after the London Marathon I took part in the Enigma Good Friday Marathon as my final tune-up race for the Thames Path 100. Dave “Foxy” Bailey (and ably assisted by Karen Webber) are the organisers of these low-key regular marathons. I drove up from Reading and arrived fairly early to see Traviss and Rachel who were kind enough to introduce you to a few people. There were a lot of 100 Marathon Club vests on show and despite talk centering on how many marathons you have run or your personal best time (not got too much to offer here) they seemed a really friendly bunch which summed up the close knit family feel of these events. 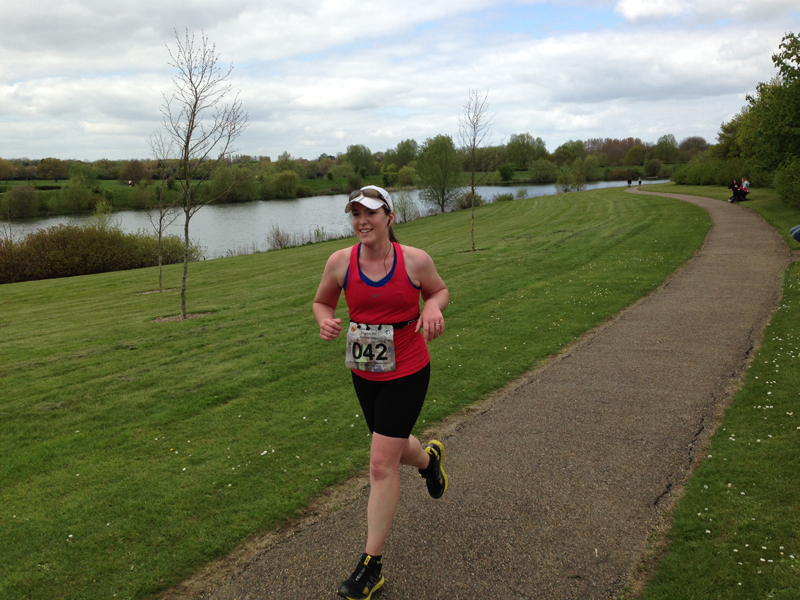 The run itself involved 7 and a bit laps around Caldecotte Lake in Milton Keynes. The course was well marked but essentially involved keeping the lake on your right. Foxy set us off at 9am after a few announcements (including today being Heather McDonalds 100th marathon) and I settled into a second group of runners as about 8-10 headed off in a lead group. After running with Traviss Wilcox at the start I settled into my own pace. This was another planned training run so I went out steady and started clocking 7.30 – 7.45 m/m pace which I maintained for the rest of the race. The legs felt ok for the first couple of laps and I ended up running the first half by myself with the lead group running a 3-3.15 pace and the runners behind me around a 3.45 leaving me in no man’s land in between! At the end of each lap we passed the drop bag point where there was water on a few treats on offer (including the awesome cookies). I also left a couple of energy drinks and gels to pick up when I needed them. The route itself was really pleasant, flat and followed a figure of 8 around the lake; the weather was crisp and sunny at first although it did seem to get a little more overcast towards the end. It was a little breezy in places especially a quarter-half mile stretch towards the latter end of the lap when the wind was in your face, always a pleasure to run that section each lap. At the half way point I started to catch up and lap a few other runners which broke up the solitude of the run and it was nice to say hello and wish other runners all the best as I trotted around lap after lap. I don’t really mind lapped races to be honest and quite enjoyed the run. Towards the last third of the race and my legs were starting to feel the effects of the run as they started to stiffen resulting in a shortened stride but not too uncomfortable just that usual “marathon legs” feeling you get towards the end of the race. I passed a few more people on different laps and as I made my way around the penultimate lap where Karen (on timekeeping duties) waved the bell to indicate it was the last lap. I got my head down for the last few laps and ran my fastest laps (marginally) with a few sub 7.30m/m at the end. Ahead of me I spotted Flanker from Fetch and got my head down to catch up and say hello and then I spotted another chap ahead (Rik) and caught up with him before we ran the last few hundred yards together finishing in 3.20 something. I got changed and watched some of the other runners and chatted for the next hour or so and captured a picture of Naomi Newton-Fisher finishing below. A week ago that would have been a new personal best so was pretty happy with that effort after London a few days earlier. My pacing was pretty steady with a slight negative split although I’m not sure how much the legs would have coped if I had tried to go quicker so I think I ran it about right. Thanks to Foxy and crew for an enjoyable day. I will definitely look to comeback for another Enigma run in the future. Next up is the Thames Path 100 after a 2 week taper and the aim will be to try and crack a sub 20hr time. The running has been going well over the last couple of months and warm up races have gone to plan (with the lesson being to pace things steadily) so if I can manage some night running (Pacers please note I might need some “encouragement” here) this should be perfectly achievable.